​These courses are intended for Healthcare Professionals who may require a completion card for their job. Topics include CPR and AED, Basic or Advanced Cardiovascular Life Support, Stroke training, and more. Please contact your employer to ensure that you are selecting the correct course from the list below. Same day certification cards issued immediately after class! 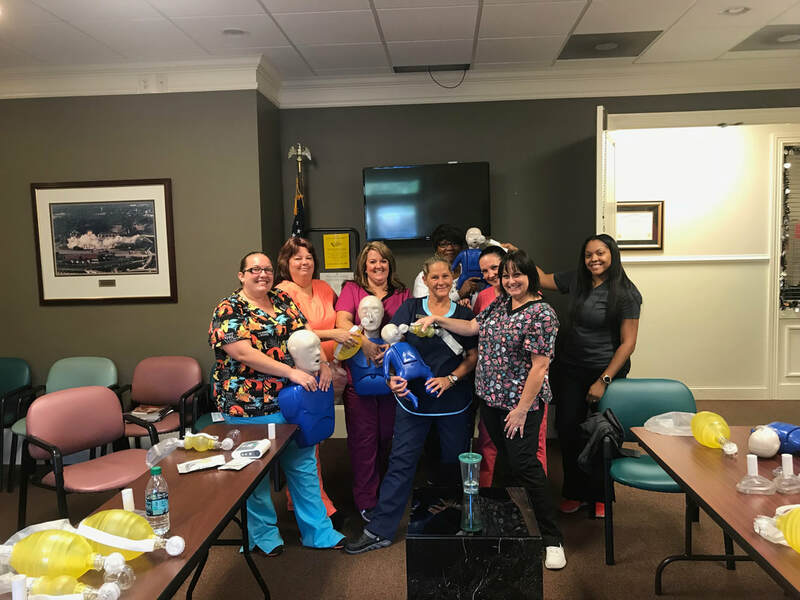 From Medical Offices to Warehouse or Corporate environments, Daycare Programs, Schools, Churches, and Non-Profit Organizations, Attentive Safety CPR and Safety Training provides the CPR training and required certifications to ensure safety and peace of mind. Attentive Safety CPR and Safety Training can handle ANY size training group. This flexibility makes us a preferred training partner for many organizations in the area. But it doesn’t matter how big your business is – our group CPR classes always have a 1 student to 1 manikin ratio. This enables a hands-on, knowledge-based process that also makes for shorter class times. Many Group First Aid CPR AED training sessions take so long simply because students are waiting around for a manikin. That’s not the case with Attentive Safety CPR and Safety Training. ​CPR training can save lives. And it can also be an excellent way to build office camaraderie. Managers and supervisors would agree – it’s never a bad time to increase employee morale. CPR training might not seem like an ideal event to have fun, but it’s actually the perfect method for creating some unexpected office entertainment. You’ll never know when you’ll need to save a life. Yet new AHA research shows that most U.S. employees are not prepared to handle health emergencies in the workplace because they lack training in CPR and First Aid. Are you one of the 50% who can locate an automated external defibrillator (AED) at work? With 10,000 cardiac arrests annually in the workplace, this small piece of information has the potential to save thousands of lives. ​Immediate CPR and use of an AED can double survival rates. Is your workforce prepared to respond? ​Why choose Attentive Safety to provide your company CPR training? ​EASY SCHEDULING- We come to you for 5 or more students. Any day, anytime. Our instructors are available as early as 7am to the late evening of 10pm to book your class. THE BEST INSTRUCTION- Our instructors love to teach! Your employees will love their training! The American Heart Association is the world’s most respected CPR certification you can receive. All our instructors are AHA certified. Our instructors share real-life CPR and emergency scenarios to help make training enjoyable and memorable. See what others are saying about our classes. Our American Heart Association CPR and First Aid certifications are valid for two years. Our pricing is fair and does not include any hidden charges. We offer classes that address your specific needs. Click on these titles to learn more about the trainings.